This is one I wished I had documented a bit more. It’s one of two summits I wanted to activate on my way home from the White Mountains. I didn’t do any video, and only took two pictures. At the time I wasn’t thinking of it as much of a special summit, since it was a drive-up summit. But reflecting on it, there were lots of unique aspects making it an interesting activation. This is a pretty straightforward drive on dirt roads, directly off of Highway 395. If you follow the “route” link at the top of this post, Google Maps can get you there. I made sure to download the area for offline use on Google Maps before going there, in case I had no cell service. This turned out to be a good idea, as there was no cell service until I got to the top—and even that was flaky. I did this drive in a car, but I’d recommend something with high ground clearance. And make sure you have a good spare tire! There are a lot of rocks on the road, and as you get nearer the top, there’s even obsidian on large sections of the road. Yeah, obsidian—volcanic glass! I was really nervous driving over what essentially amounts to big shards of glass on the road. But it went fine. I gotta say, it’s kinda cool driving to the top of a volcanic crater. 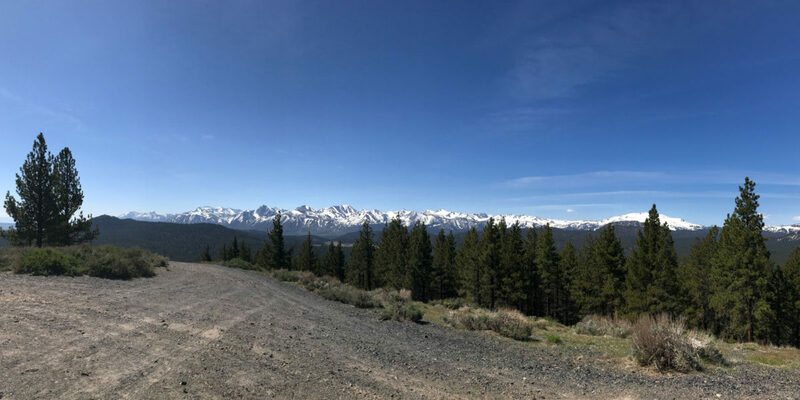 It took me about 15-20 minutes to drive to the top, from Highway 395. Arriving at the top, there’s a loop to either park or turn around. I chose to turn around and head back down a bit, so that I could walk to the summit with my gear, in the spirit of SOTA operation. I had a snack and threw everything into my smaller backpack, and walked over to the summit. Views are really excellent to the south/southeast, looking at the Sierras. I set up my linked dipole in a flat place that seemed nobody would drive through (or I’d at least be able to ask them to go around), and checked for cell service—good to go! With almost no cell service, I did manage to send out a self-spot with the SOTA Goat app. Right away, I had 4 QSOs on 20 meters, including one DX—ZL1BYZ again, from New Zealand! I had gotten him in the log 2 days earlier, when I was up in the White Mountains. Up until this second QSO with him, I was still doubting if we’d actually made contact. Now doubt was dispelled. After 20-meter operations slowed down, I switched to 40 meters and got two more. I tried a few CQ’s on 2m FM, but got nothing. With that, I packed it up and headed back to the car. A fun little 8-point activation!